Some puppies ears are erect as early as eight to ten weeks but generally the pup's ears are up by 4 or 5 months of age. If this is not the case with your puppy, become very interested in your German Shepherd Dog's ears. It is not unusual for the German Shepherd Dog puppy ears not to be up until four to five months of age. It is also quite common & completely normal for a puppy to have erratic ear carriage - up one day and down the next - especially when going through the teething process and for this cycle to repeat as the puppy's ears become erect. The teething process generally takes valuable calcium from the puppy's developing ear structure to those developing teeth and that is one good explanation for the whole procedure of German Shepherd Dog puppy ears being up one day, and then down the next as the puppy matures. Try stimulating your puppy to use his ear muscles so that the ears may become erect faster naturally. This can be done by making interesting noises, etc. to get his attention and make him use his maturing ears. Also give brisket bones to exercise the jaw muscles. Do not try and stimulate the muscles through touching as this may damage the cartilage in your pups ears, which can affect the ear carriage. It is not time to panic. However, some puppies do need a little assistance in getting their ears to stand up. We recommend the puppy owner contact either their Breeder or their Veterinarian and perhaps they will recommend the taping of your puppy's ears. Warning: PLEASE DO NOT LET ANYONE - CHILD OR ADULT - PLAY WITH OR PET YOUR PUPPY'S EARS. 1. Other puppies biting or tugging on the ear. 2. Humans, especially children who like to rub or play with the puppy’s ears. 3. Neglect! Not examining and cleaning the puppy’s ears properly. 4. The puppy constantly sleeping with its head wedged up against the wall of a crate. A German Shepherd puppy should never be left alone with other dogs that are mouthy, and might like to tug on the puppy’s ears. German Shepherd ears should never be rubbed excessively or played with by human hands. This can weaken the cartilage and cause the puppy’s ears to never stand correctly. Never leave a German Shepherd puppy with young children unsupervised, and make sure anyone who comes in contact with the puppy understands that its ears are not to play with. 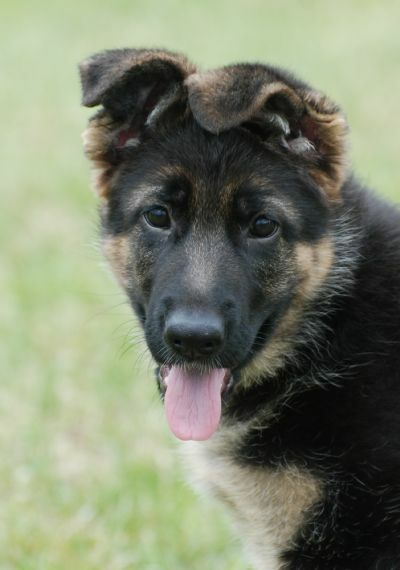 ​Soft Ears: "All GSD pups are born with hanging ears, which should start to erect in the second or third month of life. During teething, carriage is not ideal, but the majority of dogs develop the erect ear carriage, typical of the breed. Some have weak muscaluture, so the ears are not as firm as breeders might hope. However, some never get ear erection, and remain with hanging (soft) ears. This is another simple recessive trait, in which soft ears to soft ears would give 100 per cent soft ears. Most breeders reject soft-eared dogs from their breeding program." Quoted from Pet Owner's Guide to the Shepherd Dog by Dr Malcolm Willis.